Peel the rhubarb and cut in to small pieces/cubes. Peel the apples, remove the core and dice the flesh. Melt 50g butter in a saucepan then add the rhubarb and apple. Add the sugar, cover and cook for 30 minutes. Add the honey, mix well and then cook until all the liquid has evaporated. Cut each sheet of filo pastry into rectangles. Brush a little melted butter on a rectangle, sprinkle with icing sugar and then top with a second sheet of filo. Brush with butter and sprinkle with icing sugar. Repeat this process until you have 3 filo stacks for each person. Place the filo stacks on a baking tray, transfer to the oven and cook for 4 minutes at 220°C. Allow the filo pastry to cool before assembling your mille-feuille. 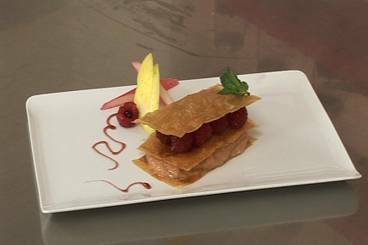 Assemble the mille-feuilles by spreading a layer of rhubard and apple compote on to a filo sheet, top with a second filo sheet. Create a layer of fresh raspberries and finish with a third filo sheet. Dust with icing sugar to serve.